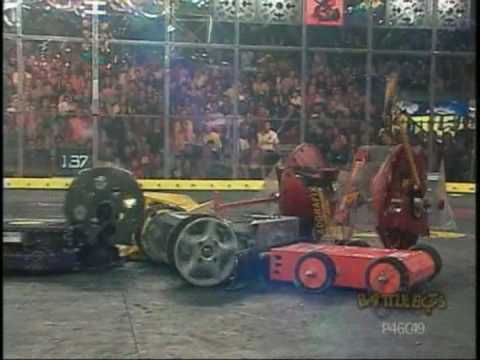 BattleBots Season 3.0 Heavyweight Rumble, with Towering Inferno, May 2001, RAW FOOTAGE! RAW UNEDITED FOOTAGE–NEVER AIRED OR RELEASED! BattleBots Season 3.0 210lb heavyweight rumble, with Towering Inferno (by Jason Dante Bardis). The Best of the Infernolab Disc 4 Video 14. How effective was Towering Inferno? It sounded? like the hammers didn’t do much. Yeah,? they copied them so much they had identical copies of Ian and Joe Watts. Because it is the bigger brother team…they just changed the colour :P? It’s just another? paint job. It does just look like Bigger Brother after a yellow paint job and a few flowers painted on it. :D? The way I see it, if all personnel have cleared? the box, that’s not a problem, Let the other 11 robots damage it beyond use. Isn’t Little Sister? just Bigger brother but.. different? Little Sister? was basically the only bot to do more than superficial damage. Joe and Ellie Watts, (Little Sister) (Bigger? Brother) won Minor Melee in Robot wars. Best drivers under twenty in the world. 3:30 to cut the crap?